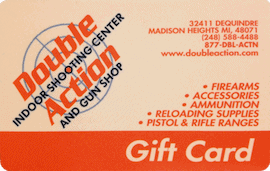 Double Action Gun Shop & Indoor Shooting Center is an awesome place to host your Bachelor Party or Bachelorette Party. We have plenty of room for groups looking to use our indoor gun range for their next party. No problem, we have nearly 100 rental firearms available to choose from. Not sure what type of gun range is best for you? We have three indoor gun ranges to choose from. Let us help you make your event a fun and memorable one. We have a 150′ – 10 station rifle range. We have a 75′ – 10 station handgun range. We have just installed a live fire simulator range, which takes the excitement to a whole new level. We have an excellent reputation in the industry.